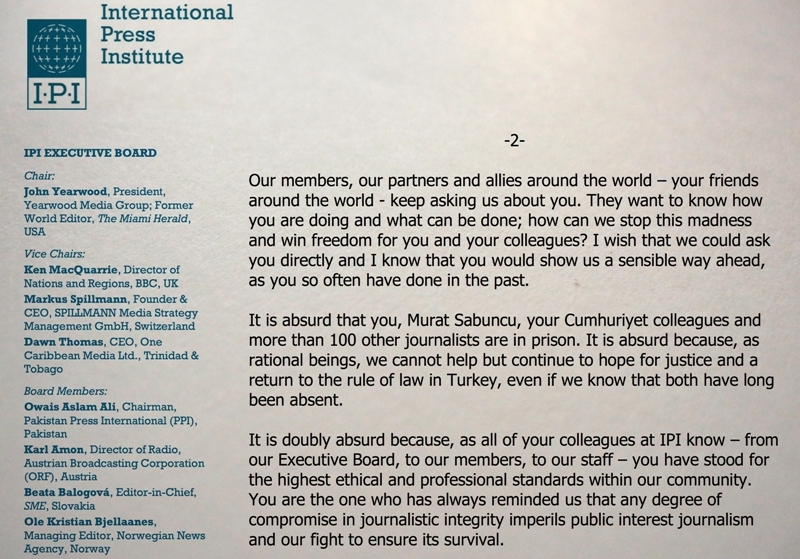 “We will not stop fighting until you and your colleagues walk free”, IPI Executive Director Barbara Trionfi concluded in the letter she addressed directly to IPI Executive Board Member Kadri Gürsel and all journalists currently in jail in Turkey. The letter is intended to bring hope to all imprisoned journalists, and specifically to Kadri Gürsel, and to remind them that the commitment of IPI as well as other international organisations to fight for their freedom will remain undeterred. “It is absurd that you, Murat Sabuncu, your Cumhuriyet colleagues and more than 130 other journalists are in prison. It is absurd because, as rational beings, we cannot help but continue to hope for justice and a return to the rule of law in Turkey, even if we know that both have long been absent,” Trionfi said. The letter also criticises Turkish authorities for the arbitrary and unjustified arrests of almost 139 journalists based on bogus charges of abetting a terrorist organisation. The “purge” that followed the failed July 15 coup d’état has been widely criticised by many other international organisations, including the European Commission, which expressed its concerns in a recent report on the country. Trionfi ended her letter with a message of hope: “We ask that you stay strong and know that we are with you. Injustice stands today, but it will not prevail”. Please see Barbara Trionfi’s letter in full below or click here to download PDF. I hope that this finds you doing as well as possible, given the current circumstances. Your detention and continued imprisonment has come as a profound shock to all of us at IPI and I write to share our unwavering support for you, your Cumhuriyet colleagues and all journalists behind bars for their work. We are well aware of your courage and your absolute and unquestionable dedication to independent journalism as the only type of journalism that deserves this name. A journalism that aims at understanding and explaining society in all of its complexity and multifaceted aspects; at exposing what is wrong and what is against the interest of the people and the fundamental values and principles on which our democracy stands. A journalism without which democracy cannot exist. We recognize how much you already have suffered for this and we knew that imprisonment was a risk for standing up for this principle in Turkey. But we nevertheless are disturbed that this has come to pass. For years, we have fought by your side for the rights of our colleagues in Turkey; for the freedom of numerous journalists held for years without trial, justice or even clarity about the accusations they face. For years, we also have listened to Turkish government representatives’ empty promises to respect the independence of the judiciary, and to their ridiculous insistences that the dozens and dozens of journalists that they imprison – often to release later, with no charge – are criminals and terrorists. We saw the depths to which they would stoop to manufacture cases against their critics, yet we trusted that your record of integrity and support for democracy and human rights ultimately would shield you from becoming a victim of these same abuses. Our members, our partners and allies around the world – your friends around the world – keep asking us about you. They want to know how you are doing and what can be done; how can we stop this madness and win freedom for you and your colleagues? I wish that we could ask you directly and I know that you would show us a sensible way ahead, as you so often have done in the past. 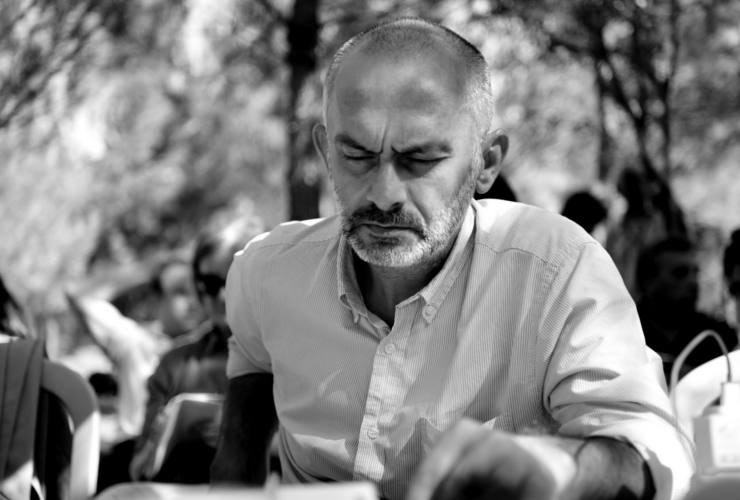 It is absurd that you, Murat Sabuncu, your Cumhuriyet colleagues and more than 100 other journalists are in prison. It is absurd because, as rational beings, we cannot help but continue to hope for justice and a return to the rule of law in Turkey, even if we know that both have long been absent. It is doubly absurd because, as all of your colleagues at IPI know – from our Executive Board, to our members, to our staff – you have stood for the highest ethical and professional standards within our community. You are the one who has always reminded us that any degree of compromise in journalistic integrity imperils public interest journalism and our fight to ensure its survival. But now, Turkey’s government persecutes you and your colleagues for allegedly supporting militants and terrorists that Cumhuriyet has criticised for years, including when they were the government’s allies. Now editors and journalists of one of Turkey’s most respected and serious newspapers are in prison on lies the government has not even bothered to fabricate evidence to support. If any good comes of this, we hope that it finally dispels any illusion that Turkey’s current government respects justice or law. Kadri, the whole IPI community is behind you and your colleagues; the free thinkers and opinion leaders of the world, who, like you, will never accept the crushing of justice and fundamental human rights, and who have admired you for your efforts to safeguard Turkey’s much-mistreated democracy. We ask that you stay strong and know that we are with you. Injustice stands today, but it will not prevail. This battle may be long, but we will not stop fighting until you and your colleagues walk free.